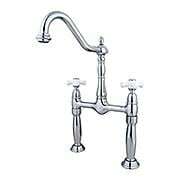 Bridge faucets have a horizontal bar that connects hot and cold water handles to the faucet spout. 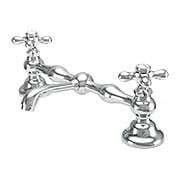 Choose from one of our high-quality bridge faucets and complete your bathroom renovation project with style. 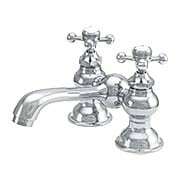 The graceful curves and Victorian-inspired details of the Chesapeake collection bring elegant style and long-lasting performance to your decor. 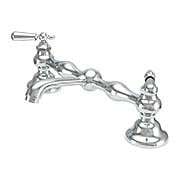 Constructed of solid brass, this two-handle bridge faucet features a drip-free ceramic cartridge system and your choice of three tarnish and corrosion-resistant finishes. 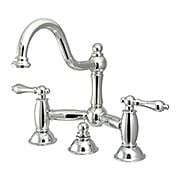 A gooseneck spout and smooth escutcheons, topped with stylish levers, are the finishing touch to this fashionable ensemble. The graceful curves and Victorian-inspired details of the Chesapeake collection bring elegant style and long-lasting performance to your decor. 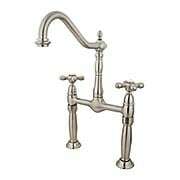 Constructed of solid brass, this two-handle bridge faucet features a drip-free ceramic cartridge system and your choice of three tarnish and corrosion-resistant finishes. 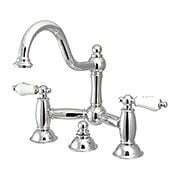 A gooseneck spout and smooth escutcheons, topped with stylish cross handles, are the finishing touch to this fashionable ensemble. The Clearwater Collection adds a unique look to any bath. This charming faucet blends smooth curves, a classic gooseneck spout, and stylish cross handles. 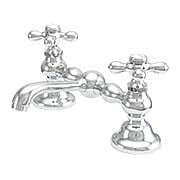 Constructed of solid brass, it comes in an array of tarnish and corrosion-resistant finishes, and features a drip-free ceramic cartridge system. Spout is fixed and does not swivel. 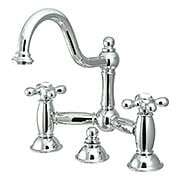 The Catalina Collection adds a unique look to any bath. This handsome faucet is an elegant blend of smooth curves, a low-profile spout, and stylish cross handles. 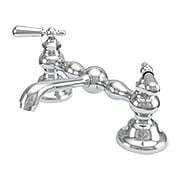 Constructed of solid brass, it comes in an array of tarnish and corrosion-resistant finishes, and features a drip-free ceramic cartridge system. Spout is fixed and does not swivel.